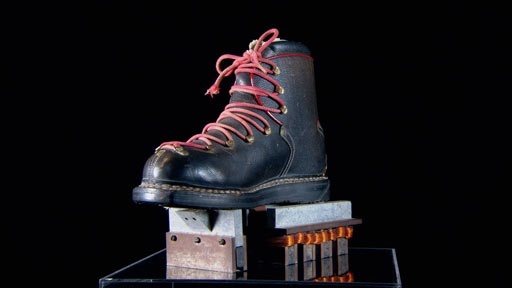 Our contributor inherited a peculiar object from his father: a jerry-rigged ski boot with a magnetic metal brick bolted to the bottom. In the 1960s, his father worked as an engineer for Westinghouse, which played a role in the space program. Could this be the prototype for a NASA space boot? The magnet seems to have several layers and wires weaving throughout. The heel of the boot contains a plug. History Detectives finds out what place this boot has in space history. Read the full newspaper article about magnetic boots. Also with Elyse Luray Civil War Cannon How did the contents of this glass tube impact the first hours of the Civil War? Related Investigation Transistor Radio Is this the oldest transistor radio in existence? Also with Elyse Luray Galvez Papers What stories do these faded legal pages reveal about a revolutionary war hero’s role in an unexpected love affair? Also with Elyse Luray Chicago Clock What role did this clock play in keeping 19th century America running on time? Also in Season 8 Iwo Jima Map What role did this map play in one of World War II's fiercest battles?